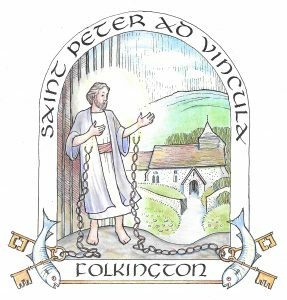 Situated a few hundred yards from the west gate of Folkington Manor, in the heart of the hamlet, lies St Peter ad Vincula, an idyllic little church with a big history. 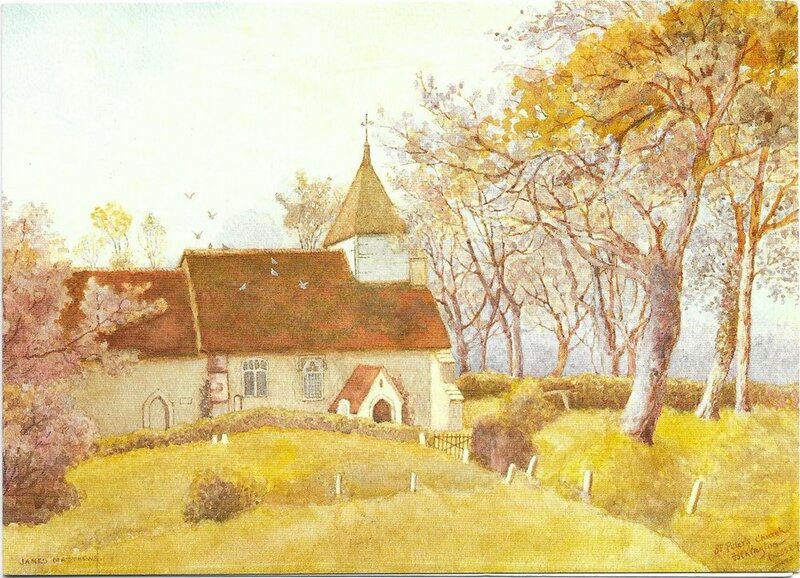 The Church of St Peter ad Vincula lies in the small hamlet of Folkington on the northern edge of the South Downs, where it is the only community building. 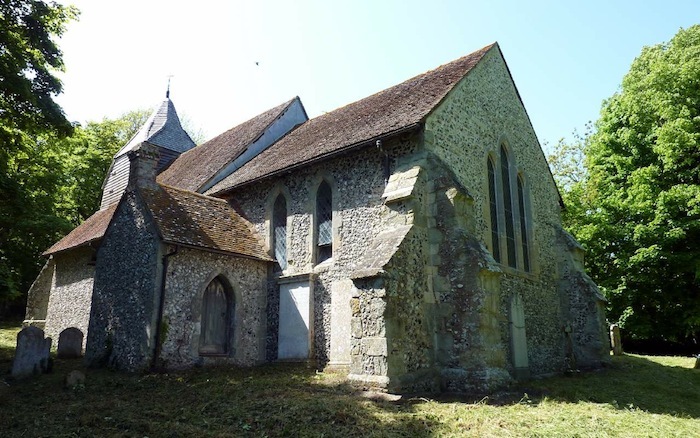 It is a classic example of a Sussex Downland church, being of simple plan and built entirely of thick ﬂint walls, unspoilt by restoration. The nave and chancel blend seamlessly at the same height inside, thereby ensuring superb acoustics for musical performances and singing. The ﬁrst recorded priest at Folkington was Gervase in 1226 (during the reign of King Henry III), and the core of the Early English building is still of this period. Grade I listed, this includes the late Georgian pulpit and box pews. There is a 15th century king-post roof over the nave and a bell-tower with an inscribed bell of the same period. A restoration programme of c.1870 built the Victorian vestry, the East window (with its pressed slab glass by Powell and Company), and a ﬁne tiled ﬂoor made by Maw and Company. 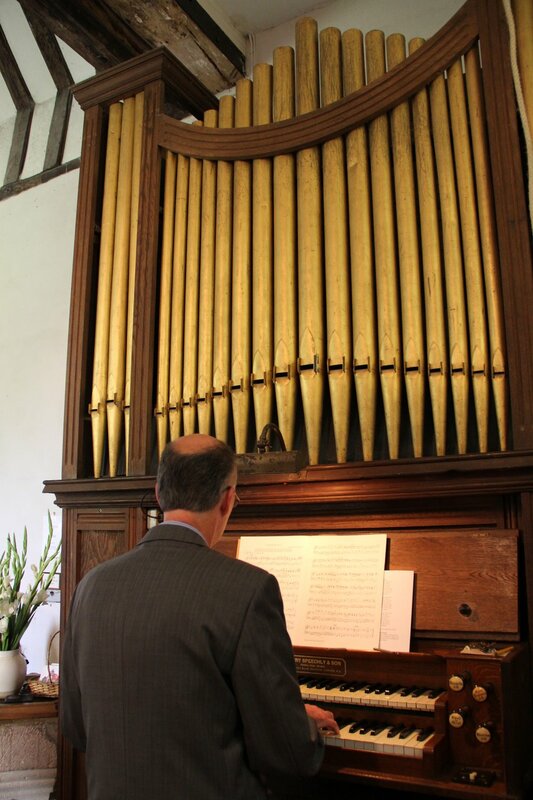 The organ was installed in 1917 by Henry Speechly and Sons, and given to St Peter’s by Mary Earle Gwynne of Folkington, in memory of the village men who lost their lives in the Great War (and as a tribute to those who returned). 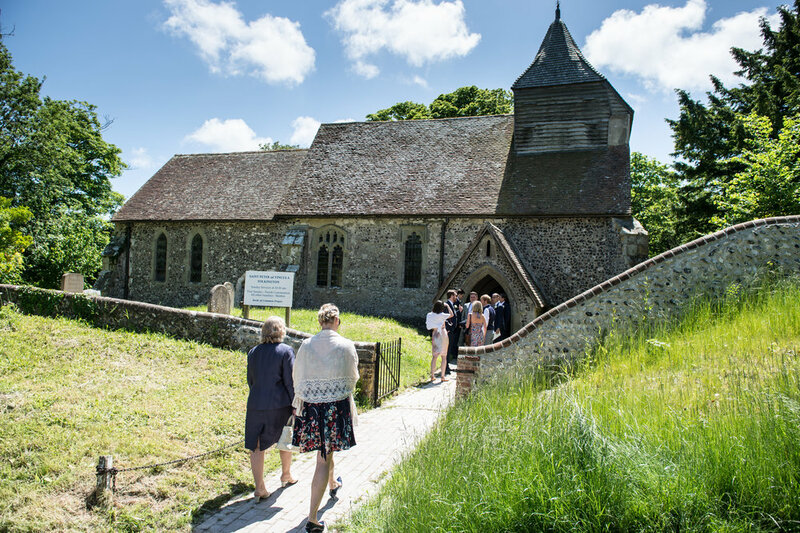 There is a singular collection of monuments and memorials, including a low-relief carving of The Risen Christ by the renowned Sussex sculptor John Skelton. The Churchyard contains various gravestones of historical interest, especially the memorial to the renowned cookery writer Elizabeth David (itself a work of art by Sussex Lettercutter and Stonemason Geoffrey Aldred). 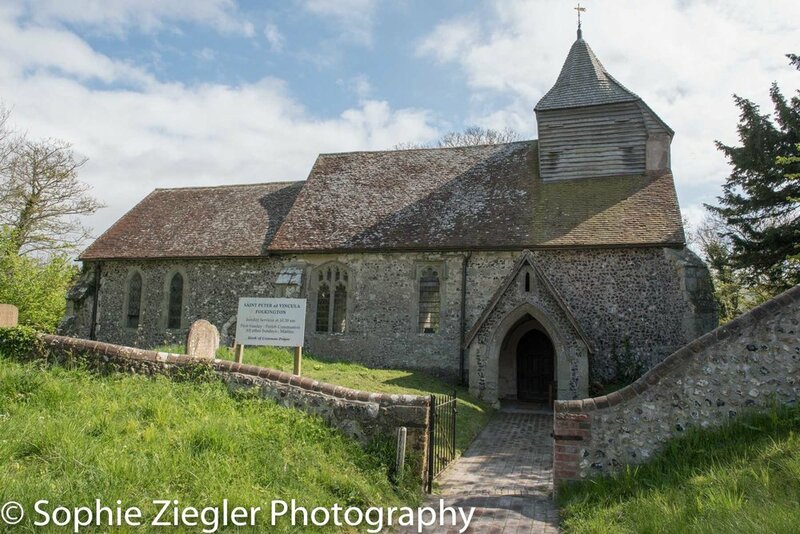 Although seemingly isolated, St Peter’s is in the South Downs National Park, on the route of the Wealdway footpath and bridleway, and also close to the South Downs Way. 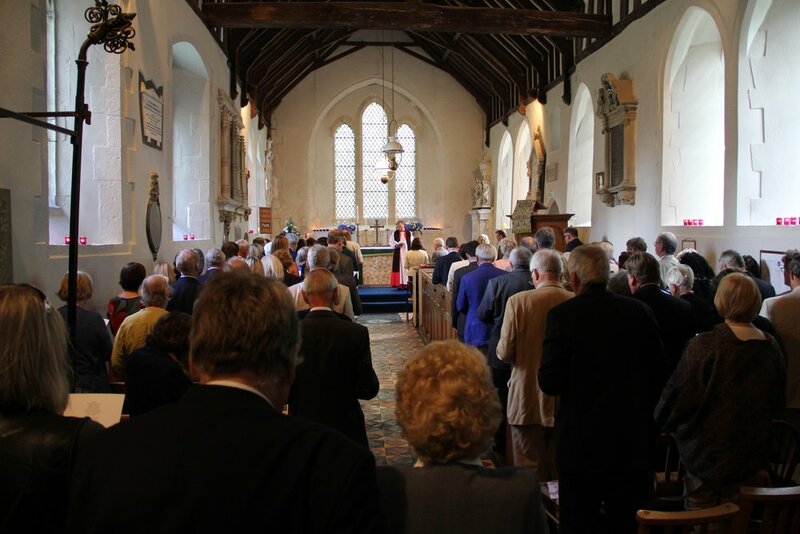 Consequently, over the year the church receives huge numbers of visitors, many of them walkers. The comments in the church Visitors’ Book show that many people look on St Peter’s as a tranquil resting-place, where they can pray, reflect and read. 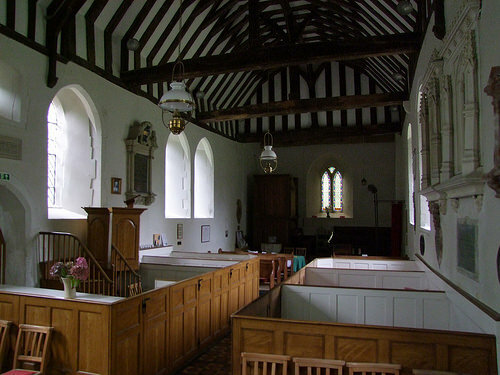 Another obvious feature are the four boxed pews with a central lectern, characteristic of the feudal era relating to the four historical properties and families that have supported the church over the centuries. The pew at the front left belongs to the picturesque ‘Old Rectory’ situated directly opposite the Church. A previous owner is Viscount Monckton of Brenchley was the most senior adviser to Edward VIII and drew up the abdication papers in 1936. His plaque is on the west wall. The central boxed pew is the Gwynne family. Folkington Manor was sold to James Gwynne in 1875 and for nearly 100 years was the family seat which included Wooton Manor, Michelham Priory and 5000 acres of the South Downs. The rear boxed pew is linked to Folkington Place whose garden abuts the graveyard. The pew on the right of the nave belongs to Folkington Manor. Folkington Manor was built by Thomas Sheppard in 1843. Sadly his wife died in 1844. The family plot is in the graveyard. Thomas died aged 91 but his four sons did not live as long. The Manor was subsequently left to his youngest son, Frederick. All the chronology of the family story is detailed on a large double plaque on the middle of the west wall. The plaque for James and Mary Gwynne is on the east wall. There is another plaque for Mary on the west wall. The organ at the rear of the church dates from 1917 and was a gift of Mary in memory of the men in the village who died in World War 1. The Gwynne’s are a unique family which has produced business people, politicians, musicians, artists, chefs and writers, many with a national and indeed international reputation. Violet Gordon Gwynne better known by her married name Woodhouse. Throughout her life enjoyed a reputation as an international harpsichord player. Violet was a colourful and enchanting individual. She was the first woman to record the harpsichord. Her original harpsichord and clavichord are now back at Folkington Manor. Violet is buried in the graveyard. Her plaque is on the west wall below the Sheppards. A name known to many is that of Elizabeth David. Elizabeth was a British cookery writer. 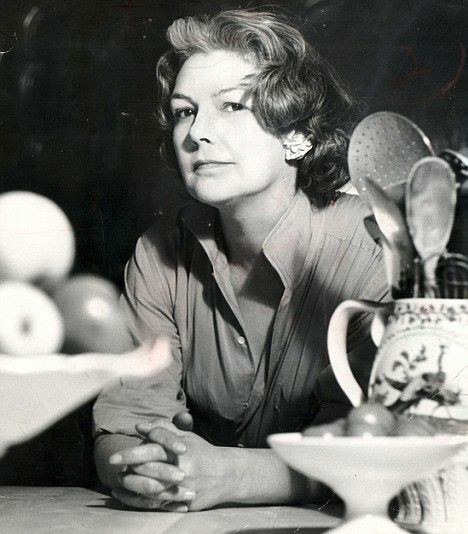 She strongly influence the revitalisation of home cookery in her native country and beyond with articles and books about the European cuisines and traditional British dishes. He father was Rupert Sackville Gwynne, the MP for Eastbourne and her mother was Stella Gwynne, daughter of the first Viscount Ridley; a plaque is on the west wall. Elizabeth David is buried in the graveyard.